Are you looking for a chainsaw that will do the job sans the expensive price tag? Do you have a tight budget for your home improvement projects? Or perhaps it’s your first time buying a chainsaw and you’d like to start off with something modest but reliable? Whatever your reasons, if you are looking for the best chainsaw under 200 dollar, we’ve got you covered. Horror films like The Texas Chain Saw Massacre may have portrayed the chainsaw as a gruesome object of violence. While chainsaws require careful handling, they can be very useful and efficient tools when it comes to woodwork activities. A chainsaw is an engine-powered saw that cuts through teeth mounted on a rotating metal chain that spins around the edge of a guide bar. It can be used in a variety of activities ranging from trimming tree branches, pruning, tree felling to firewood chopping. Gas chainsaws typically have two-stroke engines. They are usually more powerful than their electric or battery-powered cousins. This makes them ideal for professionals, as well as homeowners who would prefer to work with a more versatile tool. 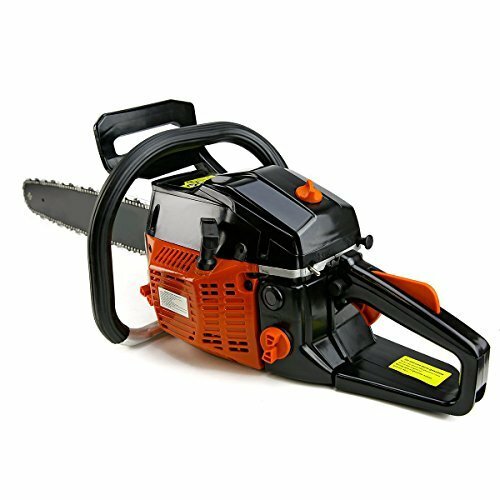 Gas chainsaws do not require power cords, which means that they are more portable. However, they are also noisier and heavier, and thus may require more careful handling. Electric and battery-powered chainsaws are typically designed for home use as these are usually lighter, easier to operate and much quieter than gas chainsaws. Some of them are battery-powered and do not need to be plugged in for electric power. Battery-powered chainsaws offer the option of greater mobility, but they are also less powerful and limited by the battery time. Generally, electric and battery-powered chainsaws are more suitable for lighter woodwork, such as trimming and pruning of tree branches or small trees. A chainsaw’s guide bar is a long metal bar with a rounded end made of wear-resistant alloy steel. A guide bar usually ranges from 16” to 36” long. The length of a chainsaw’s guide bar limits the length of the wood that can be cut through in one single pass. Of course, there are other factors at play, such as the engine power and whether it has sufficient horsepower to cut through thick logs of wood. As a note of caution, the longer the guide bar, the harder it becomes for the user to manage the chainsaw carefully. The metal saw chain is the part that cuts through the wood. Tooth design and teeth arrangement are important components that affect the metal chain’s performance. Full chisel chains with square cornered teeth are great for chopping softer woods. Semi-chisel chains with rounded teeth, on the other hand, are less efficacious for softer woods, but they are suitable for harder woods and generally more durable in terms of their sharpness. Full complement chains feature more teeth than other arrangements, such as the full skip and semi-skip arrangements. Although they need more sharpening maintenance and higher power to function, they also create smoother cuts and finer sawdust. Some modern chainsaws include anti-vibration features to reduce the tool’s vibration during usage. Excessive and prolonged vibration can cause discomfort and even serious injuries to the user, such as the Hand-Arm Vibration Syndrome. An anti-vibration handle system typically involves dividing the chainsaw into two parts: the cutting bar and the engine which generates the vibration when cutting, and the handles and controls. These two parts are then joined back through mounts that dampen the vibration. Other safety features mainly entail kickback reduction features to prevent or reduce instances where the saw chain changes direction and moves backwards and/or upwards in the direction of the user. Kickbacks can happen when the tip of the guide bar hits something without cutting through it or when the wood pinches the saw chain during the cutting process. Chain breaks and tip protectors (usually seen in electric chainsaws) are some of the typical kickback reduction features. Other standard safety features include the safety throttle lock to prevent accidental throttle trigger from driving the saw chain and a kill switch to stop the chainsaw immediately. Now that you have a better idea of chainsaws, it’s time to consider your specific needs before you make a purchasing decision. To get the best buck on your chainsaw, it pays to ask yourself the following questions. If you only need a chainsaw for the occasional light wood cutting, an electric chainsaw should suffice. However, if this is for heavy-duty wood cutting purposes, a gas chainsaw would be more suitable. Other important factors to consider would be the type of wood involved and the dimensions of the wood to be cut. A gas chainsaw would be more powerful and make quick work of hard woods like beech, elm, oak and sugar maple. Thicker trees and branches may also require gas chainsaws with longer guide bars. A chainsaw with an 18” guide bar would be able to cut a 16” diameter tree easily in one pass, whereas a chainsaw with a 12” guide bar may likely require repeated rounds of cutting. Have You Used a Chainsaw Before? If you are new to chainsaws, I would recommend that you start with the smallest and lightest chainsaw that will meet your needs. Electric chainsaws with a guide bar length of 18” and below should do the job for light to medium sized tree or wood cutting. Inexperienced users should not be attempting intensive or heavy-duty wood cutting without any professional training. For occasional uses, an electric chainsaw would be your best option as it requires lower maintenance compared to gas chainsaws. Besides the guide bar and saw chain, the engines of gas chainsaws also need to be lubricated using appropriate mixed fuel. If noise is a major concern, an electric chainsaw would be your best bet. Generally, I would recommend using electric chainsaws for home use or areas that have noise regulations. While mufflers can be a good noise control option, you should note that larger chainsaws and gas chainsaws are naturally noisier to begin with and require more noise control. Unless you are a professional logger, $200 is a realistic budget for a decently reliable chainsaw. Below are my top picks for the five best chainsaws under $200. As you go through the list, think back to the questions earlier and decide which chainsaw best fits your needs. The XtremepowerUS 22” model tops the list as the most highly powered chainsaw, featuring a 45cc gas engine, a 2.4 horsepower motor, and a 22” bar and chain, all at a relatively affordable price. With its specifications, this chainsaw can easily tackle small to medium sized trees. The XtremepowerUS 22” model is also a steal with features that are found in more expensive models, such as its anti-vibration design. Other cool features include safety designs against kickbacks and EPA approval due to its lower emissions. At 38cc, the Poulan Pro 967196401 PP3816A is the second most powerful chainsaw in the list. With a 16” bar and chain, the Poulan Pro 967196401 PP3816A should be able to take on light to medium wood cutting activities with ease. Other features include clean air filtration, an anti-vibration handle system, an automatic chain oiler and an inertia chain brake. This is a great choice if you are a homeowner looking for a reliable chainsaw for light to medium-duty usage without breaking the bank. This model tends to be rather oil-thirsty so you will need to make sure that it is constantly fed with the right oil mix. 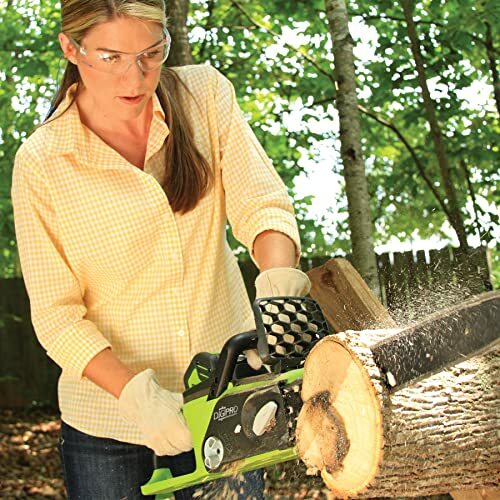 The GreenWorks 20312 40V is an excellent choice when it comes to affordable battery powered chainsaws. It is a cheaper alternative to the latest GreenWorks battery powered model. For a battery powered chainsaw, it is a great tool for light cutting and the occasional medium-duty usage. When pitted against other comparable gas chainsaws, the GreenWorks 20312 40V generates up to 70% less vibration and provides about 30% more torque, making it a safer but high-performing tool. The main drawback for all battery powered chainsaws is the price. If you include the battery and the charger, the GreenWorks 20312 40V adds up to about $206, just six dollars above the budget of $200. That said, it is still a bargain buy for a highly dependable home use chainsaw that combines convenience and power. 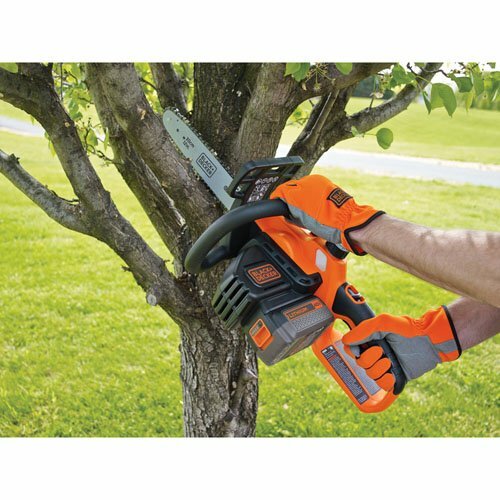 The Black & Decker LCS1240 40V can get the job done when it comes to pruning, trimming and cutting through small logs. Besides its cordless maneuverability as a battery powered chainsaw, the Black & Decker LCS1240 40V also has other cool features such as its automated oiling system for the chainsaw and tool-free chain tensioning for enhanced cutting performance. Besides the usual downsides associated with battery powered chainsaws, the Black & Decker LCS1240 40V is also limited to light-duty cutting as compared to the GreenWorks 20312 40V. WORX WG303.1 is an electric chainsaw that packs a punch for its price. For under $100, it is loaded with several features such as a 14.5 Amp electric motor with a 16” bar and chain, patented tool-free tensioning system to prevent over-tightening, a built-in safety chain brake, an ergonomic rubberized handle and automatic oil lubrication. Equipped with sufficient horsepower to take on light to medium-duty cutting activities, WORX WG303.1 can easily cut through softwood, firewood and fell light to medium sized trees. The main downside is that it needs to be plugged into power and requires an extension cord for extra maneuverability. Other than that, WORX WG303.1 is also not suited for heavy-duty cutting. Every single chainsaw listed above is an excellent pick for a budget within $200. Ultimately, the best chainsaw for you is a matter of personal preference. If noise is an important consideration, then electric and battery powered chainsaws would be more suited to your needs. If your activities require a high-powered chainsaw, then gas chainsaws would be a better option. Both are important to you, you may need to consider which criteria are must-haves and which are good-to-haves, or perhaps even consider adjusting your budget to find a chainsaw that can fit all your criteria. I hope that this article has given you the insight you need when it comes to choosing a chainsaw on a budget. Happy shopping!